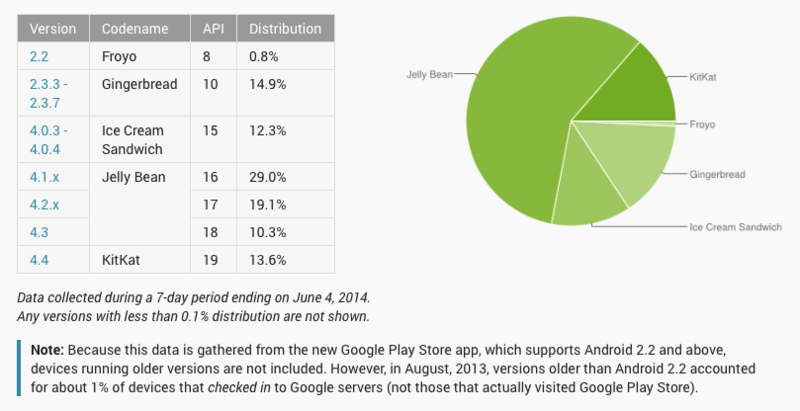 Another month, another graph showing us detailed Android platform distribution stats. Google releases these graphs each month in order for developers to better understand the current state of Android. Released yesterday, the latest Android version distribution stats show the latest Android 4.4 KitKat making great strides, though Jelly Bean still reigns supreme. While last month’s stats had KitKat at 8.5 percent, it’s now at 13.6 percent. Considering the latest major update sat at 5.3 percent just two months ago, it’s making considerable headway. That headway comes at the expense of Jelly Bean, which is still in the majority of Android handsets in the wild (58.4 percent versus 60.8 percent last month), Ice Cream Sandwich (12.3 percent versus 13.4 percent last month), and Gingerbread (14.9 percent versus 16.2 percent last month). While Gingerbread’s resilience is troubling, Honeycomb is no longer part of the list. With only 0.8 percent, Froyo looks to be following Honeycomb’s footsteps very soon, and with manufacturers shipping smartphones with KitKat preinstalled, we should expect KitKat to continue to rise the ranks. KitKat’s rise comes as Android 4.4.3 KitKat is rolling out to Nexus and Google Play edition devices. In addition, it is rumored that we will see the next major Android upgrade at Google I/O at the end of the month, so we might see it as a new entrant sooner than later.